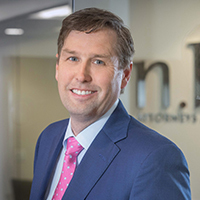 Tim Braue is a managing member at Nemphos Braue LLC where he focuses his practice on sophisticated corporate transactions. Tim has worked at some of the largest law firms in the world. In 2016, he was honored with Smart CEO’s 2016 Center of Influence Award for his work advising Baltimore’s top CEOs. Tim served in the White House under President George W. Bush and was appointed as Counselor to the Attorney General in the U.S. Department of Justice. In Maryland under Governor Ehrlich, he served as Deputy Appointments Secretary. He also led Governor Hogan’s transition team for economic development and education agencies and is currently the chairman of the Harford County Judicial Nominating Commission.